We are established Travel Agency in Mumbai from last 9 yearsWe have 13/17 push back seaterA/C. & Non A/C. Tempo Traveller9 seated push back seater dual a/c. Saral Technology Services Pvt. 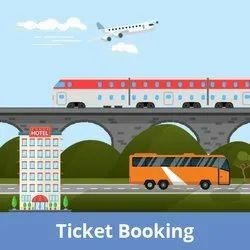 Ltd.
Our organization counted as one of the leading company engaged in rendering superior quality Rent A Bus and Bus Ticket Booking Services to our valuable clients. Widely appreciated by our customers, these services are provided by our experienced team members who are perfect in this field. We are engaged in offering Bus Ticket Booking Service to our valuable clients. The company has appointed expert professionals having in-depth knowledge with years of experience that aids in meeting the clients exact requirements. Book Chartered Bus Bus Tickets Online from India's largest Online Bus Booking site. Chartered Bus has Volvo Buses to all Major cities. Domestic Online Bus/Volvo E-Ticket Booking !! PL CORP is an Online Self Booking desktop feature customizable to any corporate needs. The technology and operating platforms have been tailored to accommodate virtually any GDS, Low Cost airlines distribution system, other travel services like hotels, cars, travel insurance, rail etc on a single booking channel. He has a powerful foresight and vision that has made him one of the most successfull Transporters. He is instrumental in transforming "Sai TRAVELS" into an amazing fleet of buses, plying successfully, to Mumbai. Mr.Manjrekar's innovative ideas produced many "first" to their name.